Story is big on my mind after performing in a remarkable project, Heart of Vashon: Telling our Story. The performance reading was one part of a community project exploring what matters to islanders about living on Vashon-Maury. Why do we choose to make our home here? What is it that makes living here special? Over 150 people responded to the call for submissions, and a script was woven together from selections and excerpts of what Islanders wrote. An intergenerational cast of readers (of which I was one) shared poems, reflections and stories that created a moving, humorous and thoughtful tapestry of Island life. Even more, it was fun to hear the knowing in the laughter, the moving words expressed by audience members in response to hearing their neighbors’ tales and thoughts, and to share in the experience of Vashon and our community in this vibrant way. Whether audience members had contributed writings or not, everyone present (as well as each islander past and present anywhere!) was part of the story. As a physical and spiritual geography, the island itself was at the heart of it. A geography tells a story. The people who dwell within it live a story. What story of earth and culture/tribe/village speak in yours? These questions are variations on what I asked in my previous post, Discover the Earth of Your Story. 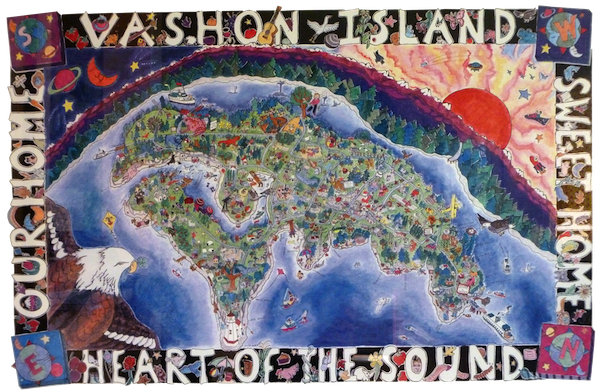 For a chance to win a ticket to the Vashon Wilderness Program Storytelling Festival or a copy of my book, Because of the Red Fox, leave a comment here in response to anything that might come to mind and heart regarding the notion of geographical story. Click here for full details regarding the Giveaway.